The Star Trek franchise scored another big winner with this feature film. Probably the film most accessible to non-fans and non-followers of Star Trek, and certainly the most humorous, this one helped foster the myth of the even numbered films being better than the odd numbered ones. Environmentalist-minded people cheered the element of the save-the-whales cause, which actually dovetailed neatly into other qualities that science-fiction usually aims at and falls short of. Thanks to both the Earthly whales and their galactic counterparts, a truly alien culture was explored in this movie, one that could not easily and thankfully was not anthropomorphized into the standard-human-with-all-and-only-human-frailties trap that most Star Trek aliens fall into, with merely a few prosthetic bits added to help keep them differentiated from us. The whales remain mysterious, keep many things to themselves, were thankfully not subtitled, and are utterly and undeniably real in doing so. "The Voyage Home" is also a time travel story, and thankfully for its first time travel outing on the big screen, Star Trek does it well here. For a film so widely acknowledged as the most accessible for non-fans, the opening 20-25 minutes contain quite a load of continuity references, things that aren't really related at all to the story at hand, but are simply there to tie up perceived loose threads from the previous two films, or to pursue odd avenues of speculation that only long-term fans might be thinking about. Perhaps the worst of these ignore the fact that our main characters have spent several months together in exile on the planet Vulcan between the last film and the beginning of this one, yet still need to have conversations as if Star Trek III just happened yesterday. Thankfully, the story keeps returning time and again to the threat of the probe, and the question of what will happen to our heroes when they turn themselves in to Starfleet. It does seem strange that Starfleet seems to have virtually no presence on Vulcan, arguably the second most important planet in the United Federation and certainly one of its founding members. The film does have an enjoyable number of recurring regulars in the Starfleet cast, including yet another return by Mark Lenard as Spock's father Sarek, as well as Jane Wyatt's only return as Spock's mother Amanda. The Spock-Sarek relationship progresses to a key and unique place here in this film, and so its inclusion is well justified. Fans may be hard-pressed to find the cameos by previous series' regulars Christine Chapel (Majel Barrett) and Janice Rand (Grace Lee Whitney). Diligently watching the Starfleet Command sequences revealed Barrett fairly readily, no longer pretending to be blonde and more resembling Deanna Troi's mother Lwaxana whom she would begin portraying the following year, but even after seeing this film about 20 times, I had to have the Okudas' text commentary point Whitney out to me. They really should not have changed her hairdo each time she appeared in the movies, although the one she sported in the first movie was not the way to go. Too bad these two characters weren't given enough significant things to say that their voices could have triggered recognition as well. The mechanics of achieving time travel are not this story's strong point, although what we get is consistent with series' history, so it makes sense that this is what our heroes would try. I submit that more than speed is required to achieve time travel, although I'll leave that argument for my article on The Unraveling of E=mc�. On the more interesting side of temporal choice mechanics and character motivations, Star Trek IV is probably far healthier than even it realizes. The idea of going back, not to change anything, but merely to retrieve a sample of a lost something and put it into the future, is a plausible goal that shouldn't need to change any bit of history or upset anybody's theories of timelines. And so, basically, it unfolds. The resulting fish-out-of-water humour here is far more successful and tasteful than what was achieved back in "The City on the Edge of Forever" as well. Perhaps we have this story's focus on respect for whales to thank for keeping the Star Trek characters in line with their principles instead of focusing on maintaining their history books. If anything, their history books embarrass them this time around, and they are all about doing something to better their own natural present. Good stuff. Kirk, Scotty, and McCoy all engage in deliberate bluffs to gain what they want initially, providing some of the humour, but at least Scotty is still presenting himself as an engineering expert and doing society some good while he's here. Nice. One of the films many perceived examples of temporal looping develops out of Scotty's suggestions here, when he speculates that perhaps the man to whom he's just given the secret of manufacturing transparent aluminum is the same man who'd invented it in the first place. So when would this theory ever be originally thought up, if Dr. Nichols learned it from Scotty, then passed it back down to him through 300 years of engineering manuals? I think it more likely that Nichols and his company possibly profited from the theory short term, then ultimately lost the secret, while someone else came up with it all on their own (like the Vulcans maybe?). Kirk doesn't get too far with his attempts at bluffing, and has to resort to the truth to be effective. Very nice turn of events, and proving to be equally if not more humorous and entertaining. And the more interesting developments of the story spring out of this vein of honesty, while the bluffs & secrecy had run out of steam. All good. Chekov gets in a bit of unexpected trouble later on, and simply sticks to the truth about himself, without giving away any more than he is asked for. Far better than what Kirk managed under similar circumstances back in "Tomorrow is Yesterday", and more humorous on top. McCoy too becomes a doctor again during the hospital sequence, and humorously brandishes his 23rd century medical knowledge in front of everyone throughout. Excellent. Sadly his criticism of kidney dialysis is undermined by having a replacement 23rd century solution as mundane and silly as resorting to pharmacology. Given that DeForest Kelley was already 10-years prior to this movie an advocate of doctors becoming more like teachers in the 23rd century, educating patients on how to use the natural healing abilities of the body to cure themselves, it is a shame that this wasn't the big idea he could've brought to this sequence. At least his arguments and solutions for Chekov seem a little more advanced. A more serious bogus time-loop explanation occurs as Kirk decides to pawn his antique glasses. Remember, someone actually has to make those glasses in the first place at some point, and when they do, how many pair will be virtually identical? Sorry, I simply disagree with Kirk's assumption that the exact same pair will make it back to him as a gift in the 23rd century. A pair was made, aged through history, was given by McCoy to Kirk as a birthday present, got smashed, came back through time on the Klingon ship, got pawned and probably sold again, and experienced those same years yet again under new ownership, and did not fall back in McCoy and Kirk's hands again during the 23rd century. What we likely have here, as in the case with Scotty's theory about who invented transparent aluminum, is a character spouting the wrong idea to the audience. Which is fair; characters are allowed to be wrong. Just don't believe it happened Kirk's way just because he thinks his theory is clever. While this movie doesn't really give any hard indication that history was changed (or for those of you more sophisticated, that Kirk and company chose their way to a different version of history than that recorded in their historical records), neither does it give any indication that all went exactly as before. Interpretation is left up to the audience, and works either way. The real question in these cases is whether or not our heroes can find their way back to the same future that they left. Whatever Spock's own doubts about his guesses in the time travel equations, it is shown quite clearly that they do come back to the precise time/space/choice location as before. Perfectly acceptable. Nicely, the ante is upped as soon as the crew return to the future, a good payoff for all the disabled vessels, stations, and control rooms we saw getting shut down during the opening. Watching the same happen to Kirk's ship just adds a wonderfully effective threat over the whole thing. One of my favourite parts of the concluding moves of this film concerns the sequence with the whaling ship, which was really well done, and seems to embody the heart of the film. I'll bet even the Klingons would be proud to see what an honourable goal their hardware achieved, and agree that the ship had a glorious death. The heroics of Kirk and crew are really spread over the course of the entire retrieval mission, and in the end simply the fact that they came up with the plan and carried it out successfully over the course of the last 3/4 of this movie earns them their due. Kirk gets a final heroic action to perform on his own - making a dangerous swim underwater to release the whales - but even this is merely an assist. The real final action is the conversation between the whales and the interstellar probe, and the nuances of this conversation are virtually impossible to memorize or get bored of because the whole thing takes place on mysterious unexplained levels. Nice one. One can only wonder, time and again, what was actually said. I think the whales George and Gracie would be lucky enough to know exactly when and where they are, let alone what the situation with their species or the rest of the planet was - a lot of that being dependent on how much information they understood from Mr. Spock during his earlier mindmeld with them asking for their agreement to Kirk's proposal. I don't think their final conversation could have been anything as specific or once more anthropomorphized as the crew suggest in the DVD extras. We also have to take one of Kirk's lines in the film with a grain of salt. In the Italian restaurant, he tells Gillian that he is attempting to "repopulate the species" by taking George and Gracie to the 23rd century. Well, that would take a lot more than two whales - a whole sizeable gene pool would be needed. The Architect character in the second Matrix film has a more plausible calculation for what is needed to start. Then again, perhaps Kirk's mission was but the spearhead for a number of Starfleet time travel rescue operations bringing more whales forward. Who knows? Musically, I can't say I'm too excited about Leonard Rosenman's work on this score. There is a very nicely composed main melodic theme unique to the film that is nicely repeated at appropriate times throughout the score, but the more official statements of it during the main title and closing credits are arranged to sound way too much like Christmas music to feel appropriate on this scenically summery movie, not to mention its arid Vulcan portions. I'll prefer Jerry Goldsmith, James Horner, and even Cliff Eidelman anyday. Once more, the producers monkey around with James Kirk's rank within Starfleet. He's such a great Captain, it seems only right that he should be promoted, yet the desk-job of Admiral really isn't his cup of tea. It really is a shame that they neglect to remember the rank in between these two which would truly be Kirk's ideal: Commodore. We've seen it before in the original series second season episode "The Doomsday Machine", as we witness Commodore Decker, who commands a starship like Kirk, yet outranks him. This would be the ideal rank for Kirk, allowing him to continue to command a ship, yet also pull rank on other captains whenever a group of ships are trying to accomplish a mission together. Oh well. Maybe we'll at least get Commodore Picard one day.... although he probably would be suited to the rank of Admiral. Well, this is a great movie, virtually clean in its use of time travel, but without actually providing any fresh perspective itself on why it was so clean. Star Trek IV is one to be watched, enjoyed, and laughed with over and over, just as classics should be. And it's a prime contender for my favourite of the original crew's six movies. Read the next Star Trek review: "Star Trek 5: The Final Frontier"
Star Trek 4 is available in various incarnations on DVD and Blu-Ray. 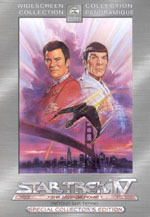 Audio commentary by William Shatner (Captain Kirk) and director Leonard Nimoy (Mr. Spock). "Future's Past: A Look Back" making-of featurette (27 min.) adding writers Harve Bennett and Nick Meyer, producers Ralph Winter and Kirk Thatcher (Punk on Bus), and actress Catherine Hicks (Gillian). original interviews of William Shatner, Leonard Nimoy, and DeForest Kelley (Dr. McCoy). 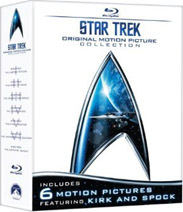 Or, get all 6 original crew feature films on Blu-ray at once with an exclusive bonus disc. Patrick Stewart, Jonathan Frakes, and Whoopi Goldberg.